You have a choice in deciding how strict your level of control will be when receiving merchandise. The choice is made through the configuration settings found in the Receipts tab of the Station Configure menu. Refer to the Configuring the Remote Station topic to learn more about these configuration settings before reading this chapter. A second, intermediate option is to use Purchase Orders but use them mainly for informative purposes. The information on the Purchase Order will be helpful in filling out the Receipt but will not restrict you when you differ. This level of control is ideal if you have managers in the warehouse/stores that you can trust to use their own discretion when receiving items you have not ordered from a vendor. At the other extreme, you could allow receipts to be made without a prior Purchase Order, effectively setting up a receiving system with little control. If you do this, you are placing a lot of trust in your vendors and that the invoices they send you match what you are expecting to receive. If you select this configuration, you will have no restrictions when making a Receipt. In that case, the procedure for creating a Receipt is virtually identical to that for creating a Purchase Order. 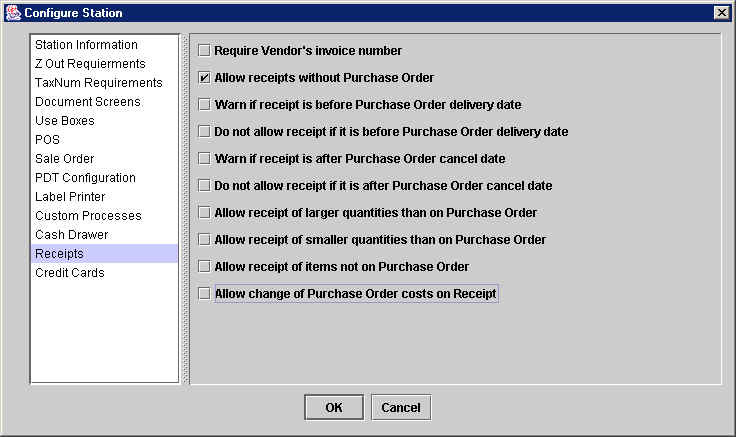 The rest of this chapter will address creating a Receipt that is linked to a Purchase Order, i.e. assumes you have chosen one of the first two levels of control previously discussed. Assuming you have chosen configuration settings that require a Purchase Order before making a Receipt, the way to link a Receipt to a specific Purchase Order is to enter the Purchase Order number in the "Pur.Ord." field in the header. If you cannot remember the Purchase Order number, go to the Documents>Purchase Orders Catalog to find the one you are looking for. Once you enter the Purchase Order number, XpertMart™ will automatically fill in the rest of the Receipt, except for the Vendor Invoice and Invoice Date fields. Depending on the configuration settings, you are then free to edit the values that XpertMart™ has filled-in. Also note that depending on the configuration, XpertMart™ will check to make sure the date of the Receipt (June 9, 2002 in the example above) falls between the Delivery Date and the Cancel Date. When you have linked the Receipt to a Purchase Order, the items you ordered will appear in the Items Area. The Order (Ord.) column shows the number of pieces you ordered for each item. This number cannot be edited since it comes directly from the Purchase Order. The Quantity (Qty.) column displays the number of pieces you are receiving. As a default, XpertMart™ will automatically set this number to the number of pieces outstanding, i.e. those that were ordered but have not been received yet. If your configuration allows, you can edit these quantities if you are receiving greater or fewer pieces. If your configuration allows, you can also enter new items into the Items Area of the Receipt. The Cost comes directly from the Purchase Order and can only be edited if your configuration allows. Likewise, your configuration must allow changes to the cost for you to be able to edit the Discount column, or for you to enter a Global Discount. The Net Cost for each item is recorded in the Cost Audit Log and averaged with the costs of prior receipts to yield the Inventory Cost. The Inventory Cost is the average cost of an item that is used by XpertMart™ whenever it calculates the margin of an item for a given Invoice. To learn more, refer to the Costs topic. If there is a Global Discount ($35.64), this discount is spread across the items in the Receipt and taken into account when recording the cost into the Cost Audit Log. (Though this is not shown on screen at the time). If you set your configuration to require a Vendor's Invoice Number, you cannot proceed without entering a number into this field. Note that XpertMart™ cannot check to make sure the invoice number you enter is correct (since there is no way you could have this number when making a Purchase Order). However, it can make sure the field is not left blank. Enter the date on the vendor's invoice into this field. Most likely, this date will be different than the date of the Receipt and the date of the Purchase Order. Use the button to the right of the field to launch the XpertDate™ tool. This drop-down menu displays the contents of the Vendor Terms Catalog. Use it to select the payment terms that the vendor is offering. Usually the payment terms are either Cash on Delivery, Prepaid, Consignment or Credit. The Days of Credit field is used when you select Credit as the Payment Type. Enter the days of credit a vendor is offering inthis field. Add the number of days in this field to the Vendor's Invoice Date to determine when this account is payable.